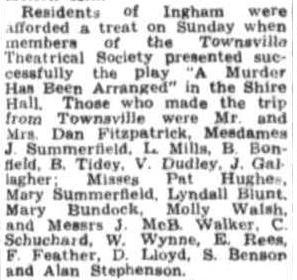 “A Murder Has Been Arranged” was performed on Friday 2, and Saturday 3 June 1950 at the Theatre Royal, and was also taken to Ingham to perform at the Shire Hall, Ingham, on Sunday 18 June, 1950. 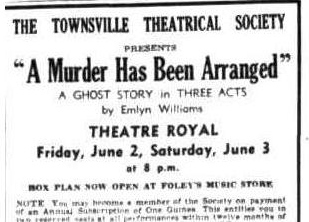 At the Theatre Royal last night, the Townsville Theatrical Society presented Emlyn Williams' 'A Murder has Been Arranged'— a glorious mixture of taut suspense (mainly created in the last act by L,yndell Blunt) hysteria, absurdity and the supernatural. Here are stock characters— the rich, elderly husband, the young beautiful wife, her adventuress mother, the so-brash young man, the evil relative and the garrulous servant; but added are some original touches— the stage being a stage, the participation of the orchestra in the plot, and, of course, the not so original, but entertaining supernatural. There is a certain air about the proceedings throughout— but it is difficult to take Emlyn Williams seriously about his 'murder' in the first two acts. He works so hard to create suspense— then destroys it, only to rebuild it. And, if it had been for nothing else, 'A Murder Has Been Arranged' would have been worth-while for four magnificent Pygmalionesque words delivered by Mrs. Wragg (played by Lettie Mills). Patricia Hughes as the wife— Lettie Mills. Beryl Bonfield as the mother and Mary Summerfield as the secretary are easy and convincing in their roles, but Lyndell Blunt, as the strange woman, is outstanding. She carries an entire act on her shoulders, and carries it well. For about ten minutes she generates wonderful suspense, then breaks the atmosphere with some blood chilling screaming. Dan Fitzpatrick, as the cause of all the trouble, made the most of his dramatic moments in Act Three. The position of Eric Rees (as Jimmy North) is never clearly defined, but he is an interesting juvenile lead. Carl Schuchard plays the rich man with gusto, and enjoys himself all the way. Stage manager, Bill Wynn makes a small appearance— for the creation of atmosphere. Producer Dan Fitzpatrick could have kept a tighter rein on the stylised acting of some of his cast, but he Is at a disadvantage in taking a leading part as well. Settings were effective and well constructed— creating the impression of a labyrinth of empty dark corridors and dressing rooms surrounding the lighted stage. For once, the designer has the task of making his stage appear very obviously a stage, and he did so by the clever use of angles and corners. 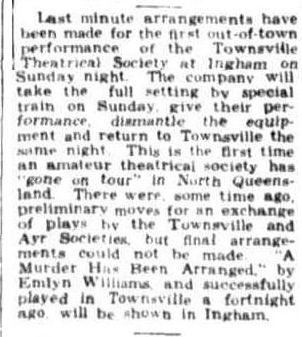 The play will be repeated to-night, and on Sunday will be taken, for one performance, to Ingham. Residents of Ingham were afforded a treat on Sunday when members of the Townsville Theatrical Society presented successfully the play 'A Murder Has Been Arranged' in the Shire Hall. 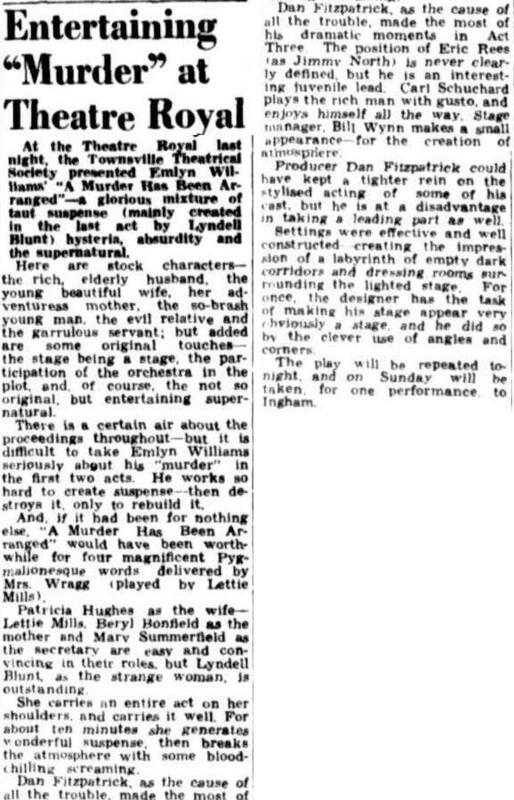 Those who made the trip from Townsville were Mr. and Mrs. Dan Fitzpatrick, Mesdames J. Summerfield, L. Mills, B. Bonfield, B. Tidey, V. Dudley, J. Gallagher: Misses Pat Hughes, Mary Summerfield, Lyndall Blunt, Mary Bundock, Molly Walsh, and Messrs J. McB. Walker, C. Schuchard, W. Wynne, E. Rees, F. Feather, D. Lloyd, S. Benson and Alan Stephenson.